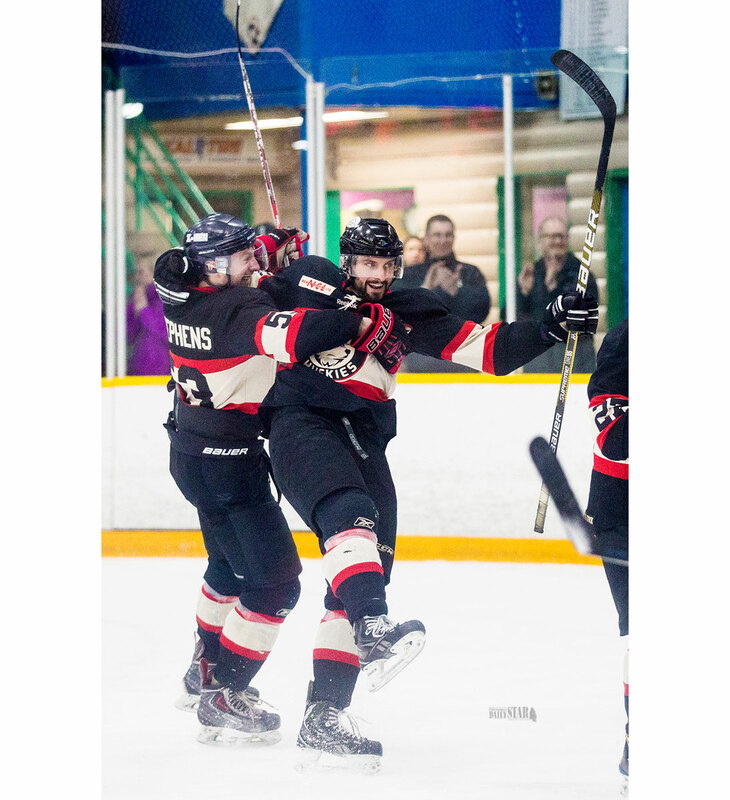 CELEBRATION – Ted Stephens and Kevin Petovello celebrate a goal during third-period Coy Cup round-robin action at Takhini Arena last night. The Sparta tied the Huskies 5-5 and will get a bye into the Coy Cup final Saturday night. The Whitehorse Huskies had to win by two. The Whitehorse Huskies had to win by two. With less than a minute left in their final Coy Cup round-robin game and up by one, they pulled their goalie and went on the attack. The extra man wasn’t enough and Kelowna Sparta’s Shawn Mueller scored an empty-netter with six seconds remaining to force a 5-5 tie. With that result, the Sparta (2-0-1) get a bye into Saturday night’s Coy Cup final while the Huskies (1-1-1) will fight for their lives in a semifinal tonight against the Terrace River Kings (2-1-0). “Tonight it was a few lucky bounces and I guess the hard work paid off and we got the bye, which is huge,” said Kelowna Sparta forward and defenceman Kelly Loudoun. Kelowna, which won it’s first two games with a short bench, welcomed the arrival of eight more players before their game against Whitehorse. Their previous skate as a team was at home last week. The Sparta welcome the day’s rest before the final Saturday. Whitehorse, meanwhile, will have to fight for their lives against Terrace, which has won their previous two Coy Cup battles. In 2016, Terrace beat Whitehorse 6-3 in the round-robin and on Wednesday night they prevailed 7-6, holding off a late Huskies surge. Gainsforth stayed composed through the game, even during a more than 20-second stretch in the third period when he was without a stick. The Huskies were up 5-3 with just over six minutes left in the game. But Charles Dagostin was called for boarding and given a game misconduct after he and Kelowna’s Kevin Walrod went awkwardly into the boards behind the Whitehorse net. The Huskies nearly killed the ensuing five-minute penalty, which was served by Ted Stephens, but Shawn Mueller got a shot past Gainsforth on the power play to bring Kelowna within one with 1:57 left in the game. The Huskies pulled Gainsforth for the extra attacker in a last-ditch effort to secure the bye into the final, but Mueller got another into the empty net to tie the game 5-5. Gainsforth said that following the game, the talk in the locker room was all about tonight’s game against Terrace. Tuton said today will be business as usual for the Huskies and he’s hoping they can build on the momentum from their games this week when they face the River Kings tonight at 7 p.m.
NOTES: The Huskies led the round-robin in goals scored. They found the back of the net 17 times. ... The North Island Capitals were eliminated from the Coy Cup following their loss to the Terrace River Kings 3-2 last night.